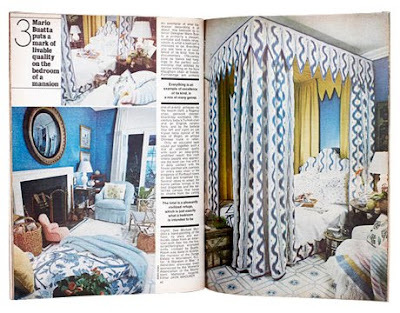 Anyway, I was flipping through it again and spent a good bit of time looking at the fun collage HB put together of their blue rooms through the years. Some of the rooms looked like their decade, but there were several that I thought would work perfectly today....probably because we're experiencing a bit of throw-back "Mad Men" style in decor, but also because these rooms have so many timeless elements. This one was my #2 favorite...I had a hard time picking out something that I thought was outdated. 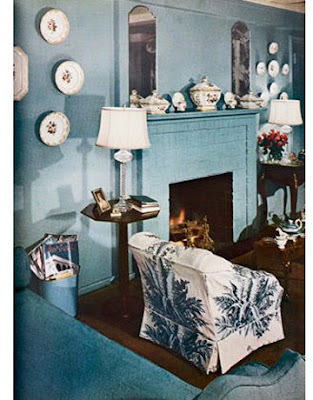 Decorating with china is timeless, I LOVE that chair and the lines of the sofa that are peeking through seem perfect. I like the tables and the lamps and the painted fireplace is chic...love it all. 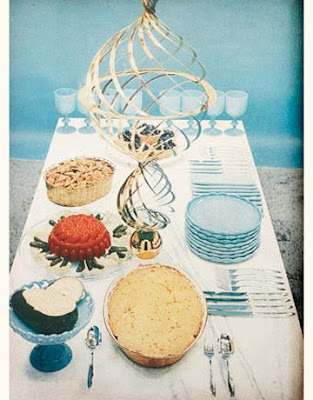 Ok, I think the Jello mold gives this one away, but only the food is outdated in this image. I ADORE that centerpiece. And obvi the color turquoise is here to stay...it was named as the color of the year by Pantone. I think this picture could hold its own on House of Turquoise (ps. Stephen Drucker mentioned HoT in the issue...way to go Erin!). 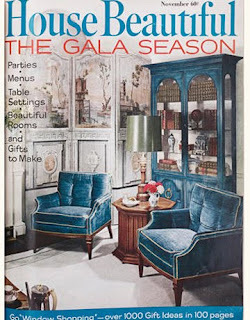 This one was my #1 favorite...those peacock velvet chairs!! And the matching cabinet behind them is wonderful...I also love the lamp and just the overall feeling of the room. I don't love the particular choice in wallpaper/fabric, but I could see this easily done today - even using this pattern. I love the mirror, sconces, framed prints and the overall concept...and is that a peek of a garden stool at the bottom of the pic? I love all the fabrics in this one - the drapes, the pillows, the chairs. I also love the lines of the couch (kind of similar to ours) as well as the brass birds sitting on the neat coffee table. Totally timeless...this room would work for me now. LOVE the fabrics and colors...and that mirror over the fireplace is amazing. So are these rooms eye-catching because we're having a throw-back to vintage style, or because they are truly timeless rooms that withstand decades and trends? Jello molds are still alive and well (though I prefer the term "concealed salad." I'll take a nice shrimp mold or tomato aspic or cranberry salad anytime. Of course, I also still own a pair of Dr. Scholl's sandals. . .Love the post. E - your Jello molds sound delicious. What, pray tell, is tomato aspic? I definitely flip back through (sometimes for weeks) and this HB was a knock-out for me so I'm sure I'll be pouring over it for quite some time. Love the rooms you've chosen -- just goes to show you that good style CAN be timeless. I absolutely do that too, It takes me a good two or three times to really elt the whole magazine sink in! lol. 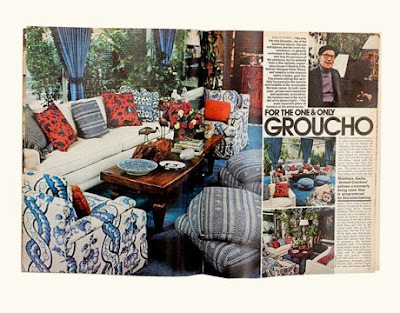 I have a nice stage of vintage home magazines.... it totally looks like thats where jonahtan adler got all of his ideas from!